Easy to use Planetarium and Sky Atlas with all the features you need to easily locate, find and learn about celestial objects in the Night Sky. Spectacularly detailed star charts, displayed in the true colours of stars, provide stunning views of the night sky complete with Planets, Comets and countless other celestial objects, to keep you looking an entire life-time! Explore the night sky with the STAR Atlas:PRO™ Virtual Sky interface to the Palomar Digitized Sky Survey (DSS). Planet positions and extensive Planetary data include the Planet's apparent diameter, phase, magnitude, rise and set times, distance and even the Planet's atmospheric composition. Follow Comets as they move through the Sky and print tabular reports. Display the best time to observe Jupiter's Great Red Spot and display the positions of Jupiter's Galilean Moons in real-time as they orbit Jupiter. Advanced Astronomical Database Manager provides you with un-paralleled ease and power when it comes to finding the objects your looking for. A powerful List Generator provides you with a tool for easily creating and exporting Lists of Astronomical Objects. Under the Stars and don't know where to look next? The integrated Observation Planner collates and plans your observations in advance, saving precious time and keeping you organized when it comes to observing under the stars. A powerful database with more than 2.8 Gigabytes (2,800 Megabytes) of popular and historical astronomical catalogues that you may browse, list and search. More than 24-Million objects stored in the mega sized astronomical database, all with data. Browse, List, Sort and Examine individual astronomical catalogues, sort Comets so that the brightest Comets appear at the top of the list. Print tabular tables of Planet and Comet positions. Attach your own images to celestial objects. Print Charts to your printer or an image file. Produce publication quality charts in Postscript and PDF format for high-resolution chart printing. Annotate charts with your own comments. Dozens of selectable chart options permit you to highly customize the way charts appear. Create your own Telescope and Eyepiece Profiles for projecting your Eyepiece field of views onto a chart. Create your own Telescope and CCD Camera profiles for projecting a CCD camera's field of view onto a chart. 27,000 images of deep sky objects (one positive and one negative image for each deep sky object from the NGC and IC catalogues). More than 1.3-Million Galaxies from Principal Galaxy Catalogue (PGC) catalogue and an additional 500,000 other objects from the HyperLEDA galaxy database. An additional 2.5-Million stars from the Tycho II astrometric and photometric reference catalogue. 129,000 Asteroids and Minor Planets from the Minor Planet Centre's Orbital Database (MPCORB). Includes the entire precision version of the Guide Star Catalogue (GSC-ACT). Includes the SAP/INET Internet Communications package for auto-downloading of additional images from the Digitized Sky Survey (DSS) and for automatic downloading of Comet and Asteroid orbital elements. Includes and highlights Telescope Alignment Stars for Argo Navis™, Meade and Celestron. Easily list and display images of deep sky objects in any Constellation. Accurate positions for all NGC and IC objects. A complete Telescope Control System and support for telescopes equipped with Digital Setting Circles (DSC). Slew your telescope to any celestial object, quickly and efficiently. Click on any celestial object, choose Slew, and your telescope automatically moves to point at that object. Supports the Argo Navis™ Digital Telescope Computer (ngcSuperMax™) Digital Telescope Computer. Celestron GT Models 60/80/114/4/130 (original series & current series). Meade Telescopes with Autostar™ I and/or Autostar II and/or LX200 command set. Meade LX200 GPS and Meade LX200 GPS 16-inch. Meade LX200 and Meade LX200 16-inch. Sky Commander Digital Setting Circles (DSC). STAR Atlas:PRO™ also supports the freely available ASCOM platform of telescope drivers. ASCOM includes additional telescope drivers like ACL Based Telescopes (Comsoft PC-TCS, Optical Guidance, DFM, and other research grade instruments), ACP Astronomer's Control Panel telescope hub, AstroOptik Research Telescopes, Astro-Physics, and the Losmandy Gemini Controller. 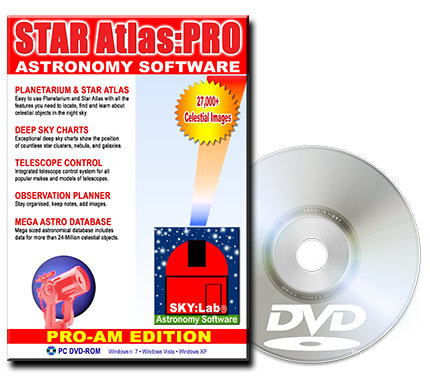 When your looking beyond the brightest astronomical objects, STAR Atlas:PRO™ has power to boast with capabilities that present you with some of the faintest astronomical charts ever made so easily available. Advanced Virtual Sky interface to Palomar Digitized Sky Survey (DSS) just point and click and watch the Image appear after it is automatically downloaded for you. Features advanced Internet capabilities for fully automatic retrieval of Palomar Digitized Sky Survey (DSS) Images, Comet Orbital Elements. Features a ready to go database of more than 15 million stars and 3 million other objects, instantly chart the entire sky to fainter than 15th Magnitude, exceeding the limits of most amateur telescopes. an extensive astronomical database consists of more than 2.800 Megabytes of celestial objects, astrophysical data and information. includes the revised GSC-ACT version of The Guide Star Catalogue for instant charts beyond 15th Magnitude. Runs on 32-bit or 64-bit Windows 10, 8, Windows 7, Windows Vista and Windows™ XP. NGC-superMAX is a trademark of JIMS Mobile Inc.
Meade and Autostar are trademarks of Meade Corporation. NexStar is a trademark of Celestron.